Within science education, questions of “what counts” as science continue to be debated. Largely at stake is the inclusion or exclusion of traditional ecological knowledge (TEK) and Indigenous ways of living with nature (IWLN) alongside Western modern science (WMS), as well as the norms through which they are included, excluded, and juxtaposed. However, given science education’s inheritance of the Nature/Culture binary, knowing nature and respecting cultural diversity are often framed as competing, conflicting, and mutually exclusive goals. Using and troubling Cobern and Loving’s call for a (re)consideration of how epistemology aligns with ontology, this chapter engages with the question: What types of ethical practices emerge within the context of multicultural science education when we account for, and are responsive to, ontology and its relation to epistemology? 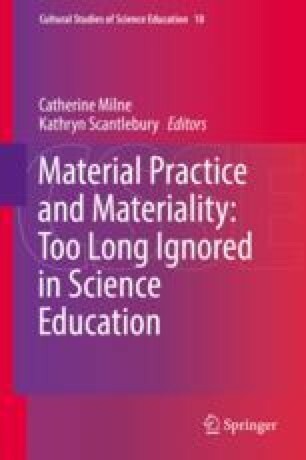 To respond, I turn to Barad’s quantum physics-philosophy to open a space of accountability for and to ontological situatedness, enactment, and production within science education. I then revisit the multicultural science education debate to ask ontological questions of the ways in which TEK and IWLN are included/excluded. Lastly, I explore possible possibilities for a science education that is ethically shaped by ontological plurality and open to the ways in which matter has always mattered for Indigenous peoples.